WINNIPEG, MB – Cindy Klassen took back the podium on Saturday, November 13, with a silver medal in the 3000m event at the 2010-2011 long track season opener at the World Cup in Heerenveen, the Netherlands. This was Klassen's first appearance on a World Cup podium for an individual race since December 2007. After some challenging years, Klassen feels as though it's all coming together and that her training program is reaping great results. Her coach, teammates, as well as Klassen, agree that she is getting stronger each day, which means there is still time for even further improvement. Klassen is continuing to work on "the snappiness" of her legs, as she puts it, which means getting off to a faster start on the openers, as she admits that she always finds her bursts of speed near the end of the race. Klassen finished in 4:07.19 seconds, about three seconds behind German, Stephanie Beckert's 4:04.38. "This was a great start to Cindy's 2010-2011 season," said Pierre Blouin, Chief Executive Officer, MTS Allstream. "Cindy is such a strong and determined athlete and it makes us proud to see that all her hard work is paying off. It's always an honour to have her as a part of the MTS Allstream family." Klassen, MTS Allstream spokesperson since 2006, has said she might compete until the 2014 Olympics in Sochi, Russia, but it's still a one year, one race, at a time journey for her now. 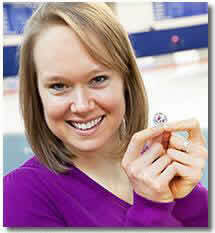 Cindy Klassen is one of Canada's greatest Olympian. At the 2006 Olympic Winter Games, she became the only Canadian to win five medals at a single Winter Olympics. She won Gold in the 1500 m, Silver in the 1000 m, Silver in the Team Pursuit, Bronze in the 5000 m and Bronze in the 3000 m. Cindy also captured an Olympic Bronze medal in 2002, making her one of the most decorated Canadian Olympic athletes in history, with a total of six Olympic medals. HEERENVEEN, Netherlands – The Canadian women's team pursuit grabbed the gold medal at a long-track speed skating World Cup event on Sunday, clinching the overall season title. Christine Nesbitt of London, Ont., took the women's season title in the 1,000-metre with a seventh-place finish. Canada's men's team pursuit also picked up a medal Sunday, finishing second behind Norway and ahead of the United States. The women's pursuit team of Ottawa's Kristina Groves and Winnipeg's Brittany Schussler and Cindy Klassen, edged Germany with a time of 3:02.05 seconds. Schussler says winning the World Cup title takes only a little of the sting out of the team's disappointing finish at the recent Vancouver Games, where they failed to medal. "It was a bit of revenge today," said Schussler. "But winning the overall World Cup title is not winning the Olympics, it's not filling a void. Obviously our goal was to win at the Olympics, but that clearly did not happen." Klassen, the veteran Olympian who did not skate in team pursuit in Vancouver, came in at the last minute to fill in for Nesbitt. She says she relied heavily on her teammates to push through. "I was hurting and Brit had to push me quite a bit during the race," said Klassen. "It ended up being good enough, so I was happy about that." The Canadian men grabbed silver with a time of 3:44.30, 1.53 seconds behind Norway. Canada is third in the overall rankings with 306 points. Norway is first followed by the Netherlands. Denny Morrison of Fort St. John, B.C., combined with Regina's Lucas Makowsky and Mathieu Giroux of Pointe-aux-Trembles, Que., in the event. Shani Davis edged the Netherlands pair of Stefan Groothuis and Mark Tuitert to complete the season with another win in the 1,000. The American, who clinched the overall World Cup title in the same race last week in Germany, captured gold in 1:08.89 seconds. The Olympic champion also clinched the overall season crown in the 1,500 metres two days earlier. Morrison finished fifth in the 1,000m standings. WINNIPEG, MB, February 10, 2010 – MTS Allstream is pleased to provide MTS TV subscribers with an insightful new biography called, Cindy Klassen, Woman of the Games. The biography is available exclusively through MTS Winnipeg On Demand – free of charge to MTS TV customers. "In the excitement and anticipation over upcoming events, this program gives Manitobans the chance to learn more about our own local star," said Kelvin Shepherd, President of MTS. "The program is both inspiring and hopeful, and shares the story of Cindy Klassen - a home-grown hero who has and continues to make us proud." Written and directed by local filmmaker Doug Howe, the 30-minute biography tells the story of how Cindy Klassen went from playing hockey on the streets of North Kildonan to becoming a world champion. The program also details the inspiring story of her comeback from injury and adversity to once again compete against the world's best. Narrated by renowned Canadian sportscaster Jim Van Horne, Cindy Klassen, Woman of the Games also features interviews with Cindy, her parents, coaches, childhood friends, and fellow speed skater Susan Auch. Pierre Blouin, CEO of MTS Allstream – one of Cindy's biggest sponsors – also provides insight into the Company's decision to support Cindy. Winnipeg On Demand features new and original local programming, available 24 hours a day to MTS Classic and Ultimate TV customers. Customers can access Winnipeg on Demand programming free of charge by pressing the A or VOD (Video On Demand) button on their remote control. It is available through MTS Video On Demand on MTS Classic and Ultimate TV in Winnipeg. It also provides VCR functionality that can play, pause, stop, rewind and fast-forward shows. For more information or to order MTS Classic or Ultimate TV, visit mts.ca/mtstv or CALL MTS (225-5687). MTS Allstream is a wholly-owned subsidiary of Manitoba Telecom Services Inc. As one of Canada's leading national communication solutions companies, MTS Allstream provides innovative communications for the way Canadians want to live and work today. The Company has more than 100 years of experience, with 6,000 employees across Canada dedicated to a mission of delivering true value as seen through the eyes of our customers. MTS Allstream has nearly two million total customer connections spanning business customers across Canada and residential consumers throughout the province of Manitoba. The Company's extensive national broadband and fibre optic network spans almost 30,000 kilometres. MTS Allstream is a proud sponsor of Cindy Klassen, 2006 World Champion and Canada's greatest Olympian, and a proud contributor to the Canadian Museum for Human Rights. Manitoba Telecom Services Inc.'s common shares are listed on The Toronto Stock Exchange (trading symbol: MBT). Customers, stakeholders and investors who want to learn more about MTS Allstream services, markets, community commitments and record of creating shareholder value are encouraged to visit: www.mtsallstream.com. "An Olympic selection process doesn't last only one week, but a full three years," explained Brian Rahill, High Performance and Olympic Program Director for SSC and long track team leader for the 2010 Olympic Winter Games. "It all started right after the 2006 Turin Olympic Winter Games, with a four-year plan designed to optimize our preparation for 2010. Every day, I see talented and dedicated athletes, coaches and support staff members working hard and together with one goal in mind: contributing to the optimal preparation of our Olympic team. Today, with only 32 days to go before the start of the Games, I am proud to introduce you to the sixteen athletes who will be representing us in Vancouver, and I am confident that they will offer great performances and will once again give everything they can on the ice of the Richmond Olympic Oval next month." Many nominations have been known for some time now, as athletes first had a chance to pre-qualify based on their results at the 2009 World Single Distance Championships, and then confirm this qualification with their performances on the Fall World Cup Circuit. The women's team will show a lot of depth, with veterans such as five time Olympic medallist Clara Hughes (Glenn Sutton, QC) who will try to defend her Olympic title in the 5000m. Canada's most decorated Olympian of all times, Cindy Klassen (Winnipeg, MB) will also be back, racing the 1500m, 3000m and 5000m. Kristina Groves (Ottawa, ON) and Christine Nesbitt (London, ON), currently leaders of the World Cup Rankings in the 1500m and 1000m respectively, are among Canada's top medal hopefuls. Shannon Rempel (Winnipeg, MB) is heading to Vancouver for her second Olympic experience, Brittany Schussler (Winnipeg, MB), who was the alternate in Turin, will get her first chance to race at the Olympics, while Anastasia Bucsis (Calgary, AB) and Tamara Oudenaarden (St. Albert, AB) will bring youth to the team in the 500m. The men's team will be led by Denny Morrison (Fort St. John's, BC), double medallist at last year's World Single Distance Championships and one of Canada's best medal hopes. Jeremy Wotherspoon (Red Deer, AB) will get to race in his fourth and last Olympic Winter Games, hoping to finally get that gold medal around his neck, as it's the one and only honour that he has yet to grab in speed skating. Kyle Parrott (Minnedosa, MB), who has improved consistently over the last few years, showed very strong performances at the Olympic selection and he qualified to race three individual events in Vancouver. Jamie Gregg (Edmonton, AB), will join sister Jessica (short track) on Canada's Olympic team, after achieving his first World Cup podium in the 500m earlier this season. Veteran Mike Ireland (Winnipeg, MB) and François-Olivier Roberge (St-Nicolas, QC) will round out the sprint athletes, while rookies Lucas Makowsky (Regina, SK) and Mathieu Giroux (Pointe-aux-Trembles, QC) will race longer distances and complete the team pursuit with Morrison. Giroux, a former short track skater, decided to switch to long track 13 months ago, a decision that is now paying off. The athletes will now be training in Calgary, where most of them will take part in their last pre-Olympic event, the Continental Qualifier, on January 23-24. The team will head to Vancouver the first week of February to finalize their preparation for the 2010 Olympic Winter Games. For the full list of athletes and the distances they will race at the Olympics, please visit www.speedskating.ca. The list can be found in the Press Room, under the Long Track Event Teams section. The Royal Canadian Mint is inviting Canadians to save the latest circulation coin in its Vancouver 2010 collection — the 25-cent coin celebrating Cindy Klassen's unprecedented five medals at the Turin Games in 2006. Cindy Klassen celebrates the launch of the Mint's latest Vancouver 2010 circulation coin; the 25-cent coin honouring her five medals in long-track speed skating at the Turin Games in 2006. "I recall the 2006 Winter Olympic Games for the pride Canadians felt as they watched Cindy Klassen sweep around the Torino Oval Lingotto and grace the podium on five separate occasions," said Ian E. Bennett, President and CEO of the Royal Canadian Mint. "Employees of the Mint could not be more proud than to have produced this coin in Winnipeg, featuring hometown speed skating hero Cindy Klassen and we wish her the very best as she competes at the Vancouver 2010 Games next month." Klassen's five medals at the Turin Games was voted by fans as the #3 Canadian Winter Olympic Games Moment of all time — out of 10 moments — in an online contest hosted last year by the Mint and Canada's Olympic Broadcast Media Consortium. Fans voted the men's and women's hockey gold medals at Salt Lake City in 2002 as moments #1 and #2 respectively. The 25-cent circulation coins celebrating these moments entered into circulation on September 29, 2009 and November 17, 2009. Designed by Burlington, Ontario artist Jason Bouwman, the moment #3 coin features Klassen in a familiar speed skating pose on the backdrop of a maple leaf. The words ‘Cindy Klassen', the year ‘2006' and the logo of the Canadian Olympic Committee also appear on the reverse of the coin. The three million coloured 25-cent coins, which were produced using state-of-the-art patented technology feature the maple leaf in brilliant red colour. Cindy Klassen, Canada's most decorated Olympian of all time and MTS Allstream spokesperson since 2006, has been recognized by Sports Illustrated magazine as one of the best Olympians of the decade. Cindy Klassen, Canada's most decorated Olympian and MTS Allstream spokesperson, has been recognized by Sports Illustrated magazine as one of the Top 10 Olympians of the Decade. Cindy ranked seventh amongst the magazine's Top 10 Olympian Women of the Decade list – a list that includes sport icons like American beach volleyball players Kerri Walsh and Misty May-Treanor, Canadian hockey star Hayley Wickenheiser and tennis superstar Venus Williams. The men's list was topped by American swimmer Michael Phelps and Jamaican sprinter Usain Bolt. In 2006, Klassen became just the eighth Winter Olympian to collect five medals at a single Olympic Games when she won a gold, two silvers and two bronze medals in Turin. Klassen also won a bronze medal at the 2002 Olympic Games in Salt Lake City – making her the most decorated Canadian Olympian in history. "Cindy is an extraordinary person and we applaud her for all of the success she has achieved on and off the ice," said Pierre Blouin, CEO, MTS Allstream. "As part of the MTS Allstream family, we congratulate Cindy for being named one of the top ten Olympians of the decade, and continue to support her as she competes in this year's speed skating season." For a complete list of both men's and women's Sports Illustrated Top 10 lists, visit www.sportsillustrated.com. For more news, photos and videos of Cindy Klassen, visit www.mtsallstream.com/cindy. Fans can also follow her on Twitter and read her regular blog at the website. STOUFFVILLE, ON, Dec. 1 /CNW/ - cbm Canada proudly announces Olympic speed skater and six-time Olympic medalist Cindy Klassen will serve as a cbm Canada ambassador. "We are delighted that Cindy Klassen, who is an inspiration to us all, has agreed to serve as an ambassador for cbm Canada, to shine the spotlight of public attention on the world's forgotten children, those with disabilities in developing countries," said Ed Epp, Executive Director, cbm Canada." The United Nations has designated Thursday, December 3 as the International Day for Persons with Disabilities. In recognition of this special designated day, cbm Canada is launching a public service announcement campaign featuring Klassen. The nationwide effort aims to increase awareness of the challenges faced by children with disabilities, and the vital work of cbm to transform their lives. The organization asks television stations in major cities to air the PSA from December 3rd through the end of March 2010, following the 2010 Winter Olympic/Paralympic Games in Vancouver. After a serious speed skating accident in 2003, Canadian Cindy Klassen worked tenaciously to return to competition and go for the gold. In a powerful public service announcement (PSA) for cbm Canada, Klassen says, "I could have given up. But, thanks to the love and support of family and friends, I didn't; I worked hard so I could compete at the highest level again and pursue my Olympic dream." Klassen knows that not everyone is so fortunate. "Children with disabilities in the poorest countries of the world face incredible challenges; for many of them it's a matter of life and death," says Klassen. cbm Canada, an international Christian nonprofit organization, is bringing hope to these forgotten children of the world, those with disabilities, with the help of generous Canadians. cbm's vision is to ensure basic human rights for each person with a disability in a developing country, to help each child achieve his/her potential. Klassen invites Canadians to join her in supporting this important cause. For more information, the public is invited to visit cbm Canada's web site: www.cbmcanada.org, or call 1-800-567-2264. WINNIPEG, MB – After taking a year and a half off to have surgery on both of her knees, missing an entire speed skating season and dealing with a near tragedy in her family, MTS Allstream-sponsored speed skater Cindy Klassen, four-time World Champion and Canada's greatest Olympian, is happy to be returning to international competition at this season's World Cup events. "I'm really happy to be back competing against the fastest skaters in the world," said Cindy. "My training has been going really well and I'm proving to myself that I'm still on par with the world's best. Each race I compete in is one step closer towards achieving my dream of representing Canada again at a third Olympic Games." Over the past few weeks, Cindy has competed in two World Cup events - in Berlin, Germany and Heerenveen, Netherlands. According to her coaches, her training is on track to continue improving her times, to make the Olympic Team at the Olympic Trials in Calgary from December 27 to January 5, and to peak at the Olympic Games from February 12 to 28. Winnipeg-based MTS Allstream has been supporting Cindy since 2006. She's been highly visible in the company's advertising campaigns and has attended numerous charitable and customer events on behalf of the company over the past few years. Recently, Cindy has appeared on MTS building banners in Winnipeg and Brandon, and she starred in MTS's Windows Live TV and print advertising campaigns. Cindy Klassen is Canada's Olympic star. At the 2006 Olympic Winter Games, she became the first Canadian to win five medals at a single Winter Olympics. She won Gold in the 1500 m, Silver in the 1000 m, Silver in the Team Pursuit, Bronze in the 5000 m and Bronze in the 3000 m. Cindy also captured an Olympic Bronze medal in 2002, making her the most decorated Canadian Olympic athlete in history, with a total of six Olympic medals. Cindy is also a four-time World Champion. To follow Cindy Klassen's results, blog, news, and videos, visit www.mts.ca/cindy or her newly redesigned website at www.cindyklassen.com. Fans can also follow Cindy on Twitter. MTS Allstream is a wholly-owned subsidiary of Manitoba Telecom Services Inc. As one of Canada's leading national communication solutions companies, MTS Allstream provides innovative communications for the way Canadians want to live and work today. The Company has more than 100 years of experience, with 6,000 employees across Canada dedicated to a mission of delivering true value as seen through the eyes of our customers. In 2008, MTS Allstream had nearly two million total customer connections spanning business customers across Canada and residential consumers throughout the province of Manitoba. The Company's extensive national broadband and fibre optic network spans almost 30,000 kilometres. MTS Allstream is a proud sponsor of Cindy Klassen, 2006 World Champion and Canada's greatest Olympian, and a proud contributor to the Canadian Museum for Human Rights. Manitoba Telecom Services Inc.'s common shares are listed on The Toronto Stock Exchange (trading symbol: MBT). Customers, stakeholders and investors who want to learn more about MTS Allstream services, markets, community commitments and record of creating shareholder value are encouraged to visit: www.mtsallstream.com. "I think because our sport is so revered in Canada, that for hockey, the gold medal is everything." September 19, 2009 - It was a momentous victory that united a country in pride and passion, cementing Canada's position atop the hockey world and proving once and for all that hockey is Canada's game. On February 24, with millions of fans on the edge of their seats, Team Canada defeated the United States 5-2 at the 2002 Winter Games to capture Canada's first men's Olympic hockey gold medal in 50 years. More than seven years later, this moment remains etched in the memories of all Canadians, and was voted by fans as the #1 Canadian Olympic Winter Games Moment of all time. Results were revealed earlier tonight on CTV and V in the Top 10 Canadian Olympic Winter Moments, presented by the Royal Canadian Mint, which counted down the Top 10 moments (10 through 1), as voted on earlier this year by fans across the country. Coming in at #2 was the Canadian women's hockey gold medal at Salt Lake City 2002 with a hard-fought 3-2 victory over their bitter United States rival, followed by Cindy Klassen at #3 and her five long track speed skating medals at Turin 2006, the most medals ever for an individual Canadian in a single Olympic Games. For her efforts, Klassen was named "Woman of the Games" by IOC President Jacques Rogge. (See Top 10 rankings below. "Rarely does a sporting event create both a lasting emotional connection with fans and instil a tremendous amount of national pride. These Top 10 moments brought Canadians closer together as we collectively cheered on the remarkable efforts of our Olympians," said Keith Pelley, President, Canada's Olympic Broadcast Media Consortium. "With the strength of our current Canadian athletes, Vancouver 2010 promises to provide more inspiring and lasting moments that will unite a new generation of Canadians." "The Royal Canadian Mint is proud to have given Canadians from coast to coast the opportunity to relive some of the most memorable Canadian Olympic Winter moments ever witnessed", said Ian E. Bennett, President and CEO of the Royal Canadian Mint. "With Vancouver 2010 just around the corner, we invite all Canadians to save these special coins as a way to build momentum towards the Games and as lasting keepsakes of this extraordinary event in our nation's history." The Top 3 moments will be featured on 25-cent coins as part of the Royal Canadian Mint's extensive circulation program commemorating the Vancouver 2010 Olympic and Paralympic Winter Games. Each coin will have a distribution of 22 million, with three million of each in brilliant colour. The #1 Men's Hockey coin enters into circulation on September 29, followed by the #2 Women's Hockey coin on November 17 and the #3 Cindy Klassen coin on January 5. Once released into circulation, the coins will be available exclusively at RBC branches and participating Petro-Canada locations. The Mint has also produced a special uncirculated set featuring all three coloured Moments coins, available at www.mint.ca/2010. Visitors to the website can also request a free coin collector card, to keep all of the circulation coins from the Vancouver 2010 collection. The one-hour Top 10 Canadian Olympic Winter Moments special will be re-broadcast on the Consortium's suite of assets (see schedule below). In addition, the special is available in its entirety on CTVOlympics.ca and RDSolympiques.ca. Voting for the Top 10 Canadian Olympic Winter Moments began in February at CTVOlympics.ca and RDSolympiques.ca. Fans were also encouraged to share their memories about each moment. Two lucky Canadians were randomly selected as the grand prize winners and will receive a trip for two to the Vancouver 2010 Olympic Winter Games. WINNIPEG, MB – MTS Allstream Inc. ("MTS Allstream") is proud to support speed skater Cindy Klassen, four-time World Champion and Canada's greatest Olympian, as she prepares to win even more medals during the 2009/2010 season. Klassen, one of Manitoba's most successful athletes of all time, signed a multi-year sponsorship deal with Winnipeg-based MTS Allstream following her success at the Turin Olympics. "I can think of no better person to represent MTS Allstream than Canada's greatest Olympian," said Pierre Blouin, CEO, MTS Allstream. "Not only has she been extremely successful, but she perfectly embodies the values of our company. 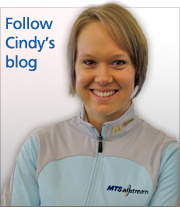 Since 2006, we have been proud to welcome Cindy as a member of the MTS Allstream family, and will continue to support her as she prepares to compete right here in Canada during the 2009/2010 season." In the following months, MTS Allstream's support for Cindy Klassen will become even more visible – especially in Manitoba. Banners featuring her image will be displayed on MTS buildings in Winnipeg and Brandon, and she will be the focus of a new TV and print advertising campaign later this summer. Sports fans across Canada and around the globe can now also access Cindy Klassen news, information, photos, and videos at www.mtsallstream.com/cindy. Fans will be able to follow her on Twitter and read her regular blog at the website. Cindy Klassen is Canada's Olympic star. At the 2006 Olympic Winter Games, she became the first Canadian to win five medals at a single Winter Olympics. She won Gold in the 1500 m, Silver in the 1000 m, Silver in the Team Pursuit, Bronze in the 5000 m and Bronze in the 3000 m. Cindy also captured an Olympic Bronze medal in 2002, making her the most decorated Canadian Olympic athlete in history, with a total of six Olympic medals. Cindy is also a four-time World Champion – allowing her to wear the crown as the most complete speed skater in the world. TORONTO, ON As a proud supporter of Canadian athletes, Sony of Canada Ltd. is pleased to announce its sponsorship of Canadian Olympic speed skating sensation Cindy Klassen. With six Olympic medals, Klassen is Canada's most decorated Olympian. Known for her dominance in sport as well as her involvement in the community, Klassen is an inspiration and role model for athletes of all ages. Through this partnership, Klassen will represent Sony at events, appear in marketing campaigns, and use the company products to enhance and promote the Sony brand. "We are very excited to be sponsoring Cindy as she trains for the 2010 Vancouver Olympics," said Doug Wilson, President & COO, Sony of Canada Ltd. "Our goal is to help athletes focus on their training in order to represent Canada to the best of their ability. 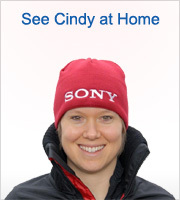 Sony wishes Cindy all the best in her training and quest for Olympic medals." "I'm thrilled to partner with Sony Canada, and am proud to represent Sony at national and international speed skating events," says Cindy Klassen. "It's a natural fit to be associated with a community and industry leader that strives for success through innovation." Over the next two years Klassen's focus remains on getting herself conditioned and in top shape for a chance to shine at the 2010 Vancouver Olympics. 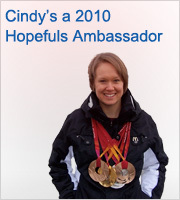 To learn more about Cindy, visit www.cindyklassen.com.